InterActiveHealth Recent Blogs Cyclist finishes race despite 8 inch splinter through leg. Cyclist finishes race despite 8 inch splinter through leg. 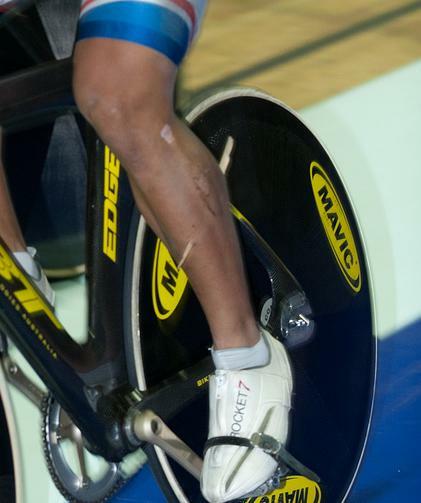 The man in the pictured above is Azizulhasni Awang of Malaysa, and this happened to him Monday, February 21st, 2011 after falling at the 2011 UCI Track Cycling World Cup Classics in Manchester, England. Cyclist finishes race despite a huge obstacle. Awang apparently fell in the last lap of an indoor racing at the final of the Men’s Keirin final at the Track Cycling World Cup. He fell with three other cyclists. He was able to get back onto his bike and finish the last lap. He finished in third place behind two others who avoided the crash. He crashed on a wooded floor, which caused a large splinter to become lodged in the mid portion of his left leg. It appears to have entered through the lateral portion of his leg, the calf, as pictured. After crossing the finish line, Awang, collapsed and was tended to by staff and medical personnel. He was taken to a local hospital and is awaiting word from a specialist who are trying to find the best way to remove the splinter. All information at this time indicates that surgery will allow for a complete recovery. One Response to Cyclist finishes race despite 8 inch splinter through leg. Now that’s got to hurt. It is sticking out of his leg.